The occupancy of the most popular hotels in Kyiv for the period of the UEFA Champions League final reaches 100%, while prices exceed the usual tariffs by 5-10 times, experts polled by Interfax-Ukraine believe. “Almost all the hotels (more than 90%) have been booked for the period of the UEFA Champions League that will take place in Kyiv on May 26. Most of them have a minimum period of booking for the duration of the match, usually three or five days. The price of rooms depends on the location of the hotel. 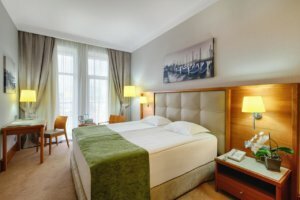 Prices for rooms in hotels in the center of the city are 5-10 times higher than the standard rate,” Natalia Chistiakova, the director of the valuation and consulting department at Colliers International (Ukraine), said. According to her, the most popular objects are three-, four- and five-star hotels in the central part of the city. Tariffs for rooms decrease with distance from the Olympiysky sports complex. In particular, according to Park Inn by Radisson Kyiv Troyitska hotel, located near the sports complex, all the rooms in the object have already been booked. At the same time, the hotel offers guests the option of including in the waiting list and after May 4 receive an answer whether there are any vacant rooms. “Given the mistakes of the previous years when carrying out the events of this level, hoteliers, more often, book rooms on a prepayment of not less than 70%,” the expert said.